Q: What are the educational requirements for a chiropractor to become licensed? A: Many people seem surprised to find out that the chiropractic education process is so extensive. The initial step is completing a typical “pre-med” undergraduate or college degree.Courses including biology, inorganic and organic chemistry, physics, psychology, various science labs, as well as all the liberal art requirements needed to graduate are included in the undergraduate education process. Once entering a chiropractic university, the same format exists as most health care disciplines.The basic sciences are covered in the first half of the educational process after which time successful completion of the National Boards Part I examination is required to move into the second half – the clinical sciences. 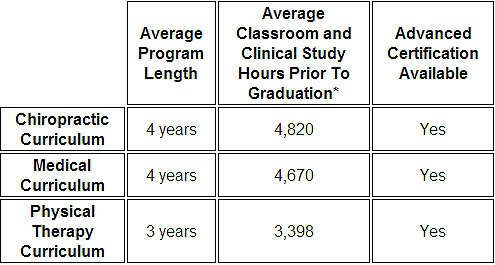 From there, internships, residency programs, preceptorship programs become available to the chiropractic student.Once graduated, residence programs including (but not limited to) orthopedics, neurology, pediatrics, radiology, sports medicine, rehabilitation, internal medicine, and others are options. There are 10 trimesters of education arranged in a prerequisite sequence and the degree of Doctor of Chiropractic (D.C.) is awarded upon successful completion of the required course of study. As a doctor of chiropractic, we are committed to providing the highest quality care available to our patients. We coordinate care with other doctors when appropriate in quest of reaching the goal of helping our patients in the most efficient, economic, and evidence-based approach possible.